Located underneath the Brisbane Powerhouse, Watt boasts sundrenched terraces and balconies, alfresco dining areas, beautiful views across the river and a spacious open forecourt. 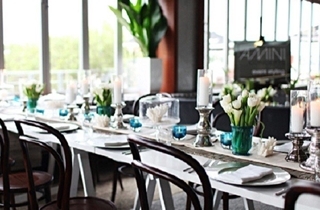 With ample free parking and a variety of private dining rooms and event spaces, with capacity for up to 400 guests cocktail-style or 160 seated guests, it provides a beautiful alfresco setting with picturesque views of Brisbane River. Overlooking the picturesque Brisbane River in New Farm, Watt Restaurant + Bar is the quintessential waterfront venue offering contemporary cuisine in a relaxed environment. Located under the Brisbane Powerhouse, Watt boasts a large sun drenched terrace and forecourt and flexible dining areas.